Sleek, sharp, and safe. 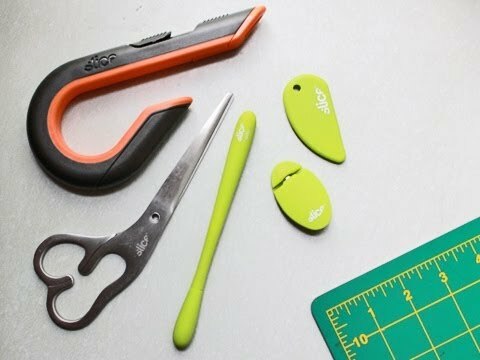 The trifecta of smart design is what makes these cutting and craft tools so appealing for all your tasks, projects, and hobbies. TJ Scimone founded Slice to help fund long-term care for his son, Alex, who is autistic (Slice donates at least 1% of product sales to autism research). His tools are much more than just colorful versions of existing cutters. TJ works with top industrial designers—including Alfredo Muccino, Karim Rashid, Scot Herbst, Michael Graves, and Yves Behar—to really rethink and redesign conventional cutting tools by focusing on ergonomics, safety and ease of use. Four of the Slice tools—the Box Cutter, Safety Cutter, Precision Cutter, and Letter Opener—feature ceramic blades, which are extremely sharp, durable and won’t rust like metal blades do. Built-in safety innovations (like the Box Cutter’s non-slip protective handle) keep the blades away from fingers. No more accidents waiting to happen. The Precision Cutter is ideal for intricate shapes with its contoured handle, and the Safety Cutter makes short work of coupon-clipping, shrink-wrap removal, and even cutting through the tough plastic of clam shell packaging. Both the Safety Cutter and the Letter Opener are magnetic, so you won’t lose them if you stick them to the fridge. Slice’s Stainless Steel Scissors are a fit for left- and right-handed users, and the Slanted Soft-Touch Tweezers do double-duty in the medicine cabinet and craft room. 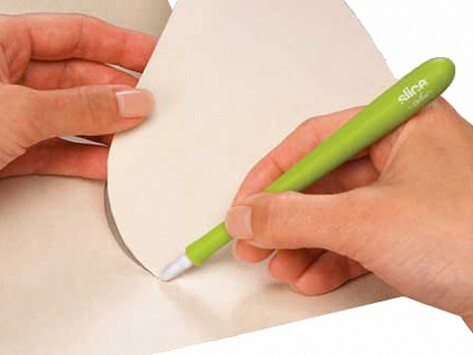 At home, in the office, and at school, these clever tools will inspire great projects.